It's a full-time job trying to stay compliant with FMCSA DOT rules and regulations. 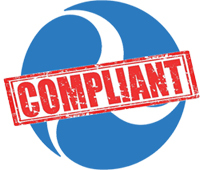 When it comes to vehicle files, our online software makes complying with these regulations simple! Just add your equipment and we'll let you know when you're due for inspections, maintenance, registration renewals, insurance renewals and much more! Our web-based software is not overly complex and loaded with every bell and whistle imaginable. It was designed to be so easy that anyone can do it with no training or learning curves. VehicleFilesOnline.com has one purpose only, to make sure that your vehicles and equipment are in compliance with FMCSA DOT rules and regulations. As you use the system, you'll notice large fonts, big buttons, color coding and other design aspects that were utilized to provide the best user experience. 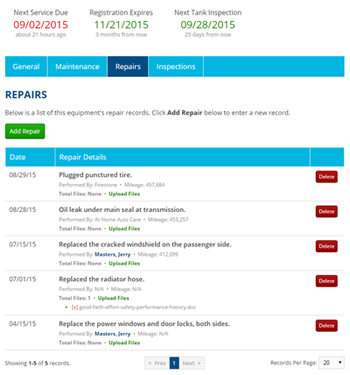 The screen shot to your right demonstrates how repair records are managed.